Arctic Cat is completely sold out of these engines, but parts are still available. If you need an engine, the best option is to have your existing engine refreshed (rebuilt). The engine will mechanically come back much better than when it came from the factory originally. And that's a fact. Now available again! As of 2/14/19 Arctic Cat has temporarily discontinued selling these recoils. We are in the process of working out a deal to have these available again, but may not be until fall 2019. Temporarily on backorder from Arctic Cat. Arctic Cat said they are in transit from the manufacturer, but no firm ETA on their arrival. 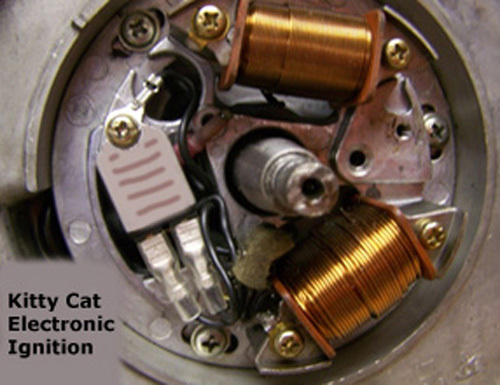 Piston & Ring Assy, +.020"
Piston & Ring Assy, +.040"
Replaces points and condenser on all model year Kitty Cats. Points and condensor was used from 1971 to 1981. This only replaced the points/condenser, so you must have a good coil. Primary should be 5500 ohms (+/- 20%). This electronic ignition increases engine power by roughly 1/3 horsepower. This kit contains instructions and parts that are used to install in either the silver Kawasaki or black Suzuki engines. The T5A/T5B can be determined by the engine decal, or the T5A has a grey primary coil and the T5B has a red primary coil. Click here for installation instructions. Suzuki or Kawasaki. If you need to test the module the ohms should read 3000 to 3100 +/-. Use the left side (black stripe) as the positive. Otherwise you'll get numbers either about 1200 or 5500. This kit is assembled by Olson Brothers Distributing and includes all the correct size seals and gaskets. The only gasket not included in this kit is the gear box gasket, which hardly ever becomes damaged. 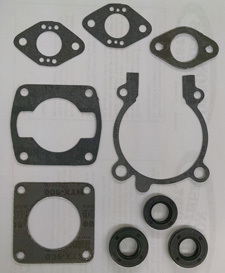 This gasket can be order separately if needed. We try to keep these in stock at all times. Retail cost of these gaskets and seals individually is $77.79. The Kawasaki kit was made specifically for Olson Brothers Distributing and includes the correct size seals and the correct gaskets. All other Winderosa Kawasaki gasket kits have the wrong exhaust gasket and only one incorrect carb gasket. We add another carb gasket to ensure a good seal where the rubber O-ring is located and includes the correct round exhaust gasket instead of the incorrect rectangular gasket. 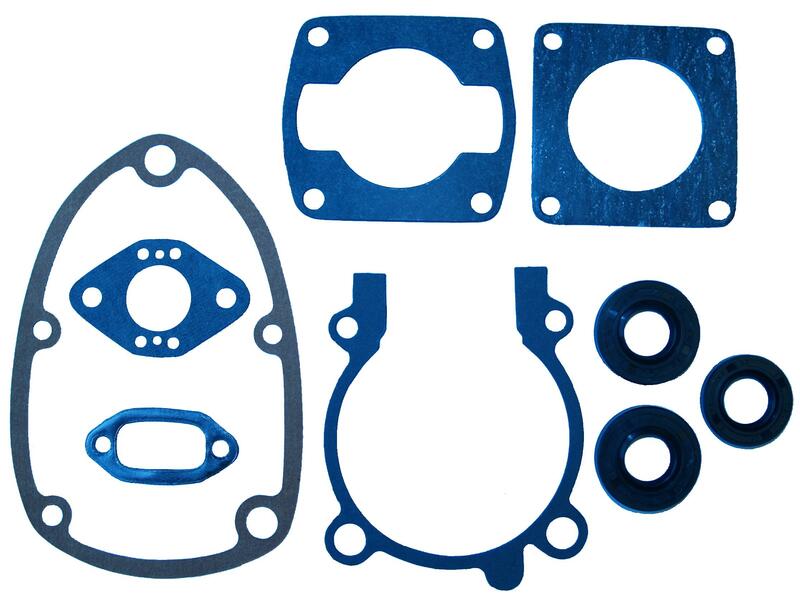 This kit does not include the gear box gasket as this gasket rarely becomes damaged and the OEM gaskets are no longer available. Other suppliers sell the Winderosa Kawi gasket kit, but no one else has the correct one. Although the part numbers are the same, only ours has the correct size seals and gaskets. 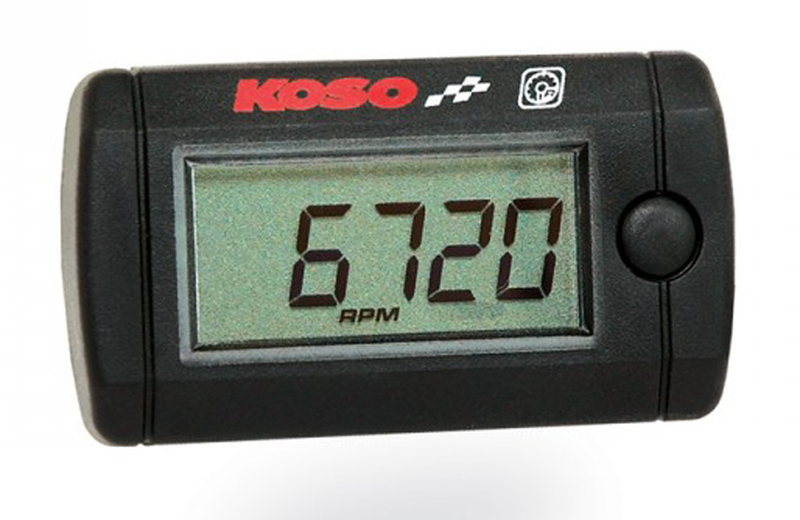 KOSO's mini RPM tach is a surface mountable Tachometer that is accurate to 15,000 rpms and features a resetable maximum RPM recall. This multifunction meter is programable to three different firing patterns to accomodate two and four-stroke engines. This tach is PERFECT for racing as it only has a 0.5 second delay between reading and display. Most mini tachs have up to five second delay. This tach retails for $89.95, but is currently being offered by Olson brothers for $79.95. Standard and Iridium NGK spark plugs for Kitty Cat and all 120cc sleds. Order on-line or call 651-395-2296. Iridium plugs last longer and have more spark surface for better fuel ignition. Copyright © 2004-2011 Olson Brothers Dist, Inc.